Made by the Vasershtrum Silverware, this 925 Sterling Silver Kiddush Goblet with matching saucer is decorated with a delicate diamond and tassle pattern.Made in Israel, Wt approx 95g. 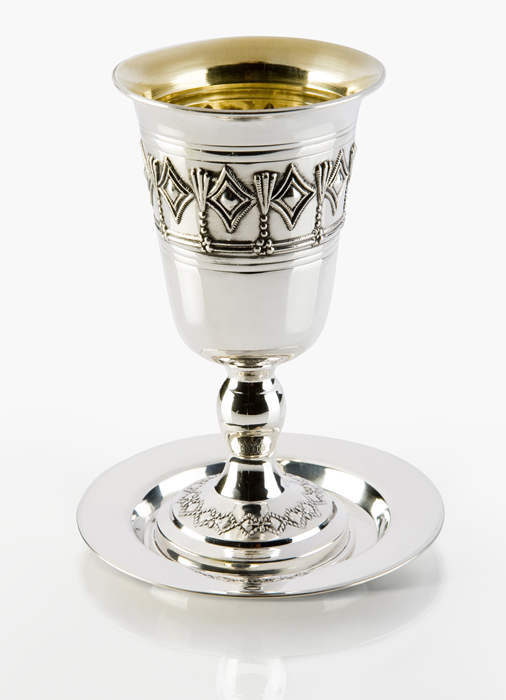 Delicate pattern of a diamond and tassle motif circle this 925 Sterling Silver Kiddush Goblet. A simple diamond pattern is engraved on the goblet's foot. The matching saucer is a plain polished sterling silver. The cup holds Shiur [halachic amount] wine required for Kiddush. Vaserhstrum - creators of fine silver, has extensive experience and a reputation of reliability and service for over 40 years. The company offers objects of Judaica, picture frames and more, all made of pure silver. Additionally, you can find silver items fashionably combined with stone, wood and crystal.